As the weather warms up and we continue to make that transition from Winter to Spring to Summer, we are all craving something sweet, yet healthy, and portable to take with us on our beach trips. 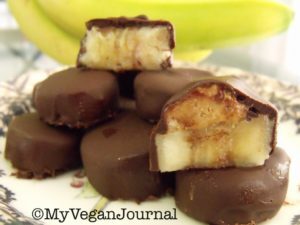 Check out this recipe for frozen chocolate covered banana bites using our Nutritional Organic Coconut Oil for the added health benefits that coconut oil brings. Slice the bananas and put them in the freezer until they’re frozen (about 90 minutes). While they’re in the freezer, put one cup of chocolate chips in a microwave safe bowl, with 2 tablespoons of coconut oil on top and microwave for 30 seconds. Microwaves vary, so adjust accordingly. Carefully remove the bowl, stir, and then put back in your microwave for an additional 15 seconds. Carefully remove, and stir again. Repeat until completely melted. Set aside to cool until it’s about room temperature. Get a piece of parchment paper ready for your banana bites and put it on a tray or plate that will fit in your freezer. Gently dip each frozen banana piece into the melted chocolate. Set each banana piece on a fork, and dunk it in to fully coat. Then gently place them on the parchment paper. You’ll notice something pretty cool happening! Coconut oil added to chocolate creates a nice “shell” on the bananas! If your bananas are frozen enough, you’ll notice it happening instantly! If you want to make them extra yummy, add a dab of peanut butter, or almond butter, to the top of the banana before you dip it in the chocolate! SO delicious. When you’re done dipping all of your banana slices, optionally place them in the freezer for 1-2 hours, and enjoy! Picture and Recipe courtesy of: My Vegan Journal.